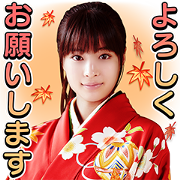 The adventures of Chihayafuru: Musubi continue on in this official sticker set from the movie. Suzu Hirose is back again to lend her voice to the karuta-playing heroine Chihaya. Go and take the lead with these movie-inspired stickers! When tapped, these stickers will play on iPhones even in silent mode.